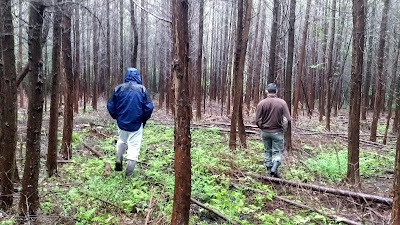 “The main point," forester Bob Williams concludes, "is conservation vs. preservation.” After hours of touring his cedar swamps it was clear: these endangered ecosystems can be successfully restored through informed human intervention – conservation. The opposing environmental school of thought, preservation, opposes intervention. It's a "public-social problem," Bob says of the latter mindset that saps support for his restoration projects. And considering the ecology of cedar swamps, preservation alone would also seal their doom. Prior to European settlement, Atlantic White Cedar swamps covered 500,000 acres from Maine to Florida. These important ecosystems purified water, acted as natural firebreaks and provided diverse habitat. Today they are 'critically imperiled' (or 'globally threatened,' depending on the environmental group). Across their range only 115,000 acres remain. In New Jersey, the only "bulwark" state of Atlantic White Cedar, there were over 100,000 acres prior to European Settlement and 40,000 acres in 1985. Now there are even less – 20-30,000 according to Bernard Isaacson, NJ DEP Forester. And the decline continues. New Jersey's cedar forests were clearcut in the 1600's. They've been clearcut 4 or 5 more times since. 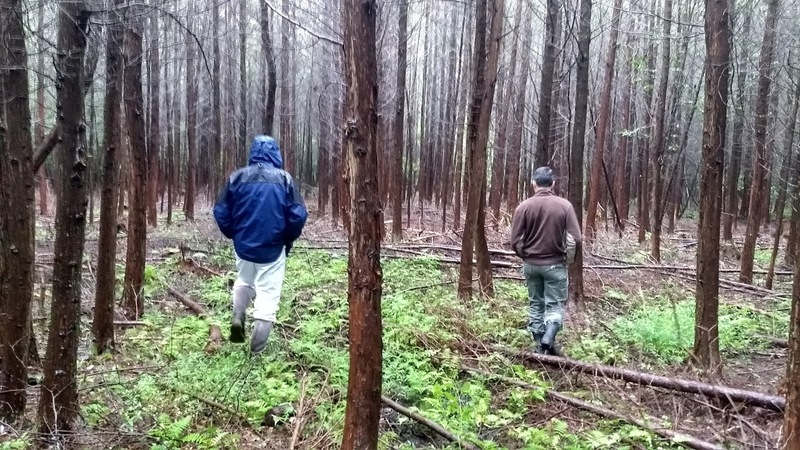 Each time faster-growing hardwoods have encroached and gradually displaced cedar in both canopy and seed bank, a problem exacerbated by fragmentation of land for human use. Historically cedar persisted by dominating large areas: if a few thousand acres were lost to fire or storm, the surrounding cedar could easily reseed it. But the current fragmentation means hardwoods are likely nearby, and more likely to establish where disturbances open new areas. Other causes include catastrophic fires, the result of fuel buildup from fire suppression by humans. They are also overgrazed by deer, who are overpopulated, also due to human interference. Rising sea levels and increasingly devastating storms also destroy large areas of cedar. 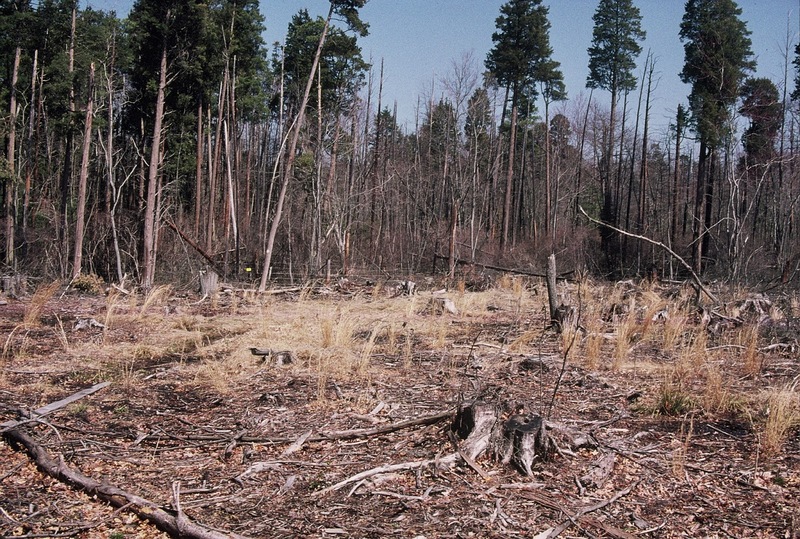 For these reasons, existing cedar forests are gradually disappearing. 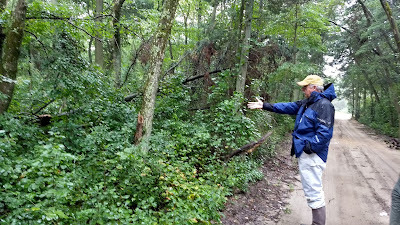 Bob and Bernie demonstrate a mature cedar forest at Clark Branch, Wharton SF (Above). Here, maple and blackgum are gradually displacing cedar, whose shade-intolerant and slower-growing saplings struggle to compete. The area used to be homogeneous cedar. But with the area's drainage “chopped into pieces,” as Bernie puts it, with cranberry bogs on one flank and cornfields on the other, the homogeneity has been shattered. “If we just leave it, it won't be cedar anymore.” According to the NJ DEP, 15,000 acres of cedar forest are being displaced by hardwoods. They will disappear, that is, if we do not act. But we must act. We must because humans have created the conditions for their disappearance, so it is our responsibility to do so, as Bernie argues. Father of two, he doesn't want to one day tell his children “there used to be this thing called a cedar forest,” but rather “this is a cedar forest and this is why they're important and why we've restored them.” Citing the example of the oysters that once filled Raritan Bay (with fisheries rivaling the Chesapeake) and are now nearly non-existant compared to their historical abundance, he feels robbed of what should be part of our natural heritage. Active conservation therefore, makes both scientific and moral sense. 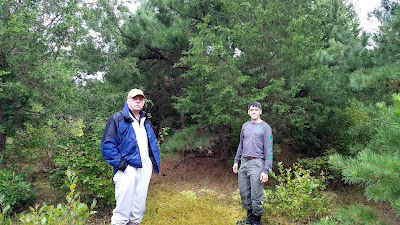 Bob and Bernie at Blue Acres restored cedar forest. Bob's flagship cedar project (three pictures below) began in 1996. The site was formerly a mix of cranberry bog and blueberry field. Each of the site's four plots received a different preparation regimen, a specific combination of herbicide, cutting and tilling, then planted 80 thousand cedar saplings throughout. The purpose of variation being to showcase multiple restoration strategies. Each ultimately succeeded, albeit on different time frames. Bob prefers the plot that wasn't planted, that instead depended on nearby seed trees for natural regeneration. While requiring more patience, this method is cheaper and encourages greater biodiversity. 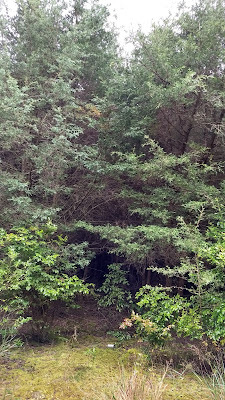 A dense and dark cedar forest. (a) A prior catastrophic fire killed most of mature cedar at this site, then maple took over. Bob clearcut the maple, applied herbicide, and planted cedar. Bob's first ever cedar project (began in 1992), the older stands were recently thinned. The reduction in density allowed growth of remaining cedar to “take off.” In a conservationist twist, the thinned cedar logs were sold to the DEP to as channel markers in the Raritan Bay. (b) In other areas, cedar that survived the fire were retained as seed trees, which reseeded surrounding areas that Bob had cleared. An improved fence of chicken-wire mesh was installed to prevent grazing. Outside the fence no cedar grows, only maple and other hardwoods. While destructive at first glance, the work fits rightly within Aldo's land ethic. 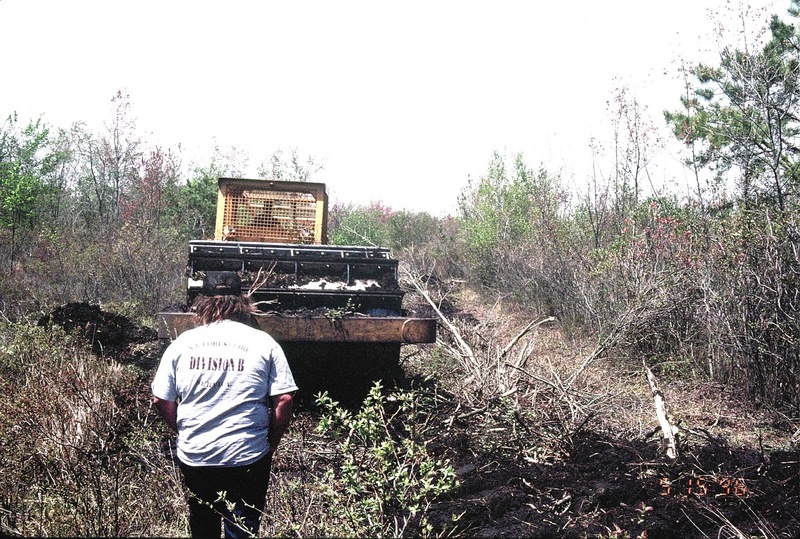 Bulldozing and poisoning a field of shrubs may appall preservationists. But, 20 years later a cedar forest will emerge, as Bob has repeatedly demonstrated, and can last for thousands more. 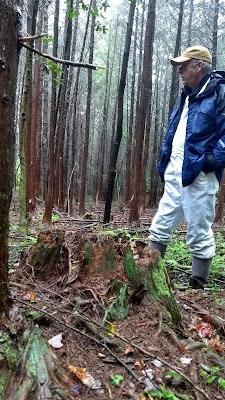 If everyone could think in “ecological time,” as Bob says, we'd be restoring cedar forests, not preserving weed-patches. Preservation can be short-sighted, at least in the case of diminishing cedar forests. If a preservationist sees an owl there, for example, he'd advocate isolating that forest for their love of that owl and their desire to save it. But without conservation work the cedars will be gone in 100 years, along with its entire biotic community. It's loving nature to death, like Lenny in Of Mice and Men. So why the popularity of preservation? Bob attributes it to the disconnect from nature, the urban vs. rural divide. “People can't tell the difference between an oak and a cherry tree, yet when they buy furniture they know they want a cherry table,” Bob says. Furthermore, an average preservationist still uses forestry products – paper, furniture, homes. Should we deforest the Amazon or elsewhere to preserve their urban, consumer lifestyle? 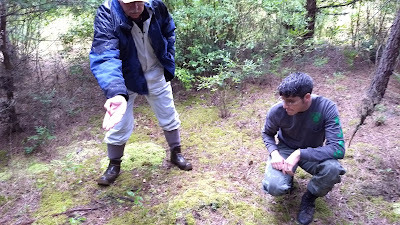 Instead we must sustainably manage our own lands, as Bob has been practicing for 30 years. He grew up with nature, hunting in the woods, his father a farmer. He understands our connection to it and our dependence on it – the water we drink, the air we breathe and the most sustainable products we could possibly use. “Forests are a renewable resource, infinitely renewable,” if managed properly. A cedar stump at the Wilson Lake site in 1992. 25 years later, surrounded by cedar. 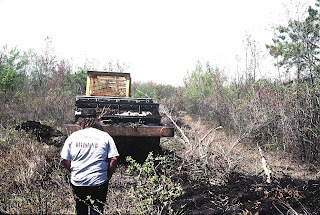 For another example of Bob's restoration work, and more details about what that work entails, see Pine Barrens Conservation - The "Ecological Forest". New Jersey Fact Sheet: Atlantic White Cedar, NRCS. - Bob Williams, President, Pine Creek Forestry LLC. GH Cook's Survey of Cape May, 1857. Pages 57-65 describe the "extensive" cedar forests with specimens older than 1,000 years. 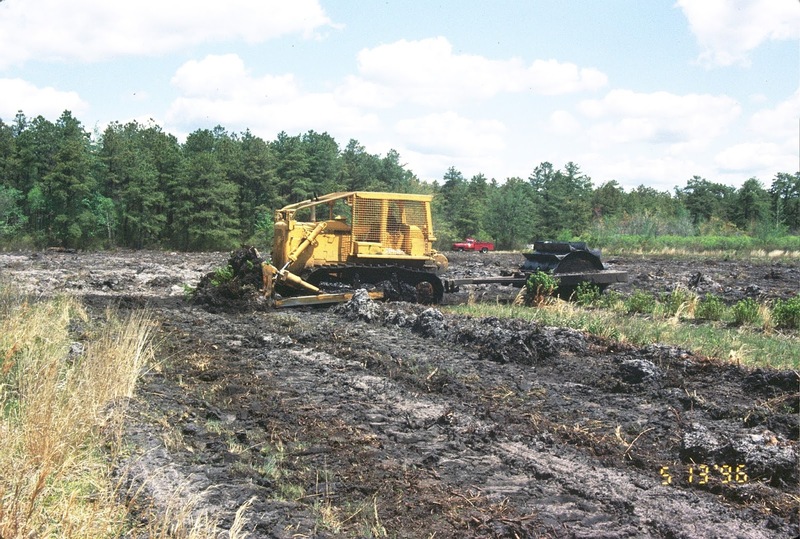 The Pinelands Commission's Comprehensive Management Plan. Page 188 has the language to support special legal treatment of Atlantic White Cedar restoration work. USDA Silvics Manual for the species, 1990. 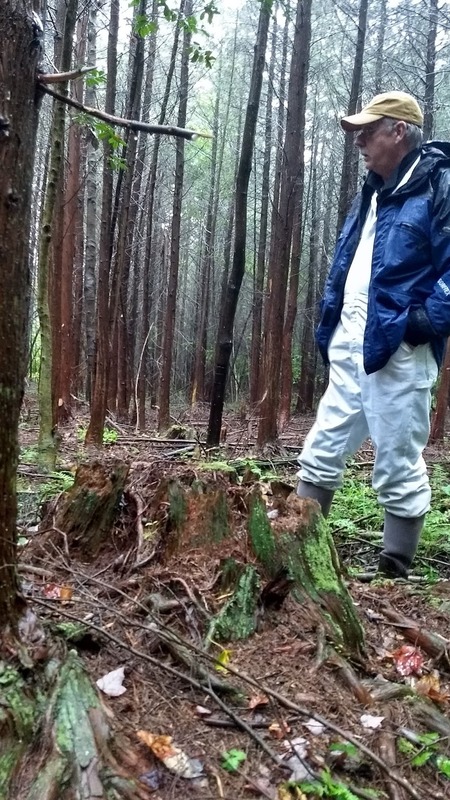 Claims population is "considerably reduced" by logging and therefore "unknown." NatureServe profile for the species. Lists conservation status as "vulnerable."